The remains of an Iron Age man found nearly 2,000 years after his death have gone on display in Manchester. 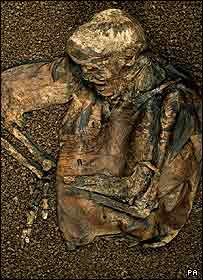 Lindow Man, who has been nicknamed Pete Marsh, was found in peat on Lindow Moss near Mobberley, Cheshire, in 1984. He was in the British Museum in London but is now on long-term loan to Manchester Museum. Lindow Man is the best preserved body of its era in the UK. Study of the remains by scientists has improved knowledge of Iron Age activities and made it possible to see the face of a person from the prehistoric past. The man, who died when he was about 25, has a distinctive furrowed brow with close-cropped hair and a beard. He was naked apart from a fox fur armband. Scientists discovered his last meal was a piece of unleavened bread. He has been on display in the Manchester Museum twice before, in 1987 and 1991. Lindow Man will be exhibited in a specially-designed space as part of the British Museum's Partnership scheme, which enables people from around the UK to see its collection.